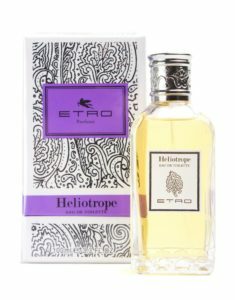 Today’s perfume is a fresh bottle of Etro’s Heliotrope. Unlike the soliflore White Heliotrope of Oriza Legrand, this expression pairs soft heliotrope with a sweet almond and cherry for a confection of a fragrance. It is almost Macaron-like. As an EDT, it doesn’t have a daylong presence, but should last through work hours without issue. Etro is an Italian fashion house founded in Milan at the heght of the Mod Era, known for their psychedelic and bohemian prints. Their perfume line is not overpriced in the realm of the Italian houses bought by LVMH, but they aren’t bargain basement artless celebrity fragrances, by any stretch of the imagination. Lingerie is a mix of a lace bra from Soma, Rago high waist sheer knickers, an Italian slip, and Wolford patterned tights.